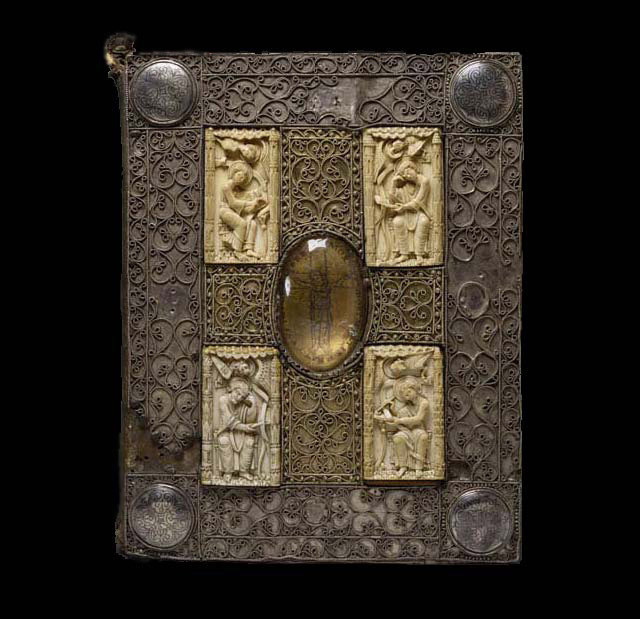 This manuscript Gospel lectionary, probably made at Regensburg in the eleventh century, is covered with a treasure binding, the front cover of which includes silver, copper gilt, ivory, and rock crystal. The arrangement of the filigree and ivory panels suggests a cross teeming with life, a reference to the everlasting life supposedly offered to humankind through Christ's Crucifixion, and, as Herbert Kessler has pointed out, this idea had been depicted in a similar fashion on earlier treasure bindings. The central feature of this cover is a large rock crystal set over a depiction on gold leaf of the Crucifixion; a small splinter of wood has been placed across Christ's chest. The inclusion of a relic of the True Cross would have enhanced the devotional properties of the cover, and would also have been suitable for a Gospel book destined for the high altar of an important monastic church. Such a book would have been considered a liturgical implement and housed in the treasury of the monastery, rather than in the library. This Gospel book, unlike the majority of medieval manuscripts, retains its original twelfth-century binding structure, including a piece of silk damask cloth covering the spine. However, there is some debate about whether portions of the front and back covers might have been produced or added later. The ivory plaque in the lower left corner, depicting the Evangelist Mark, is certainly a nineteenth-century replacement, as are the corner bosses. Recent examination has demonstrated that the back cover, sometimes claimed to be modern, is indeed a medieval production, though it has not necessarily always been the back cover of this particular book. There has been some suggestion that the rock crystal was removed and reattached at some point, and it is possible that the splinter of wood was placed there at this time. The date of such an alteration might well have been medieval, rather than modern. Although book covers were sometimes heavily reworked in the nineteenth century, many examples were altered in the fifteenth or the sixteenth century, such as the famous Lindau Gospels in the Pierpont Morgan Library (MS M.1), or another Gospel book, which in that collection (MS M.651), includes a piece of rock crystal positioned over a painting of a different devotional image: the face of Christ from the Veil of Veronica, believed to have been, like the True Cross, a contact relic of Christ.